Have you noticed the birds returning to your Loudoun lawn? Or the sun which is shining longer in the Northern Virginia landscape? Has the air felt a bit warmer in Leesburg, Aldie, Purcellville, Ashburn and Round Hill? What about in Bluemont, Broadlands, Hillsboro, Lansdowne, Lincoln, Lovettsville, Middleburg, Philomont, Upperville, Waterford and Hamilton? And have you seen that your Loudoun lawn is looking a bit greener these days? Ah…yes..because spring is all around us once again. And what makes a beautiful spring day even more glorious than beautiful, hardy perennials or brightly colored budding annuals in your landscape? Not much. 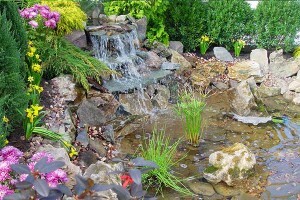 At Property Services Landscape, your Loudoun lawn service experts, we offer a wide range of design ideas to bring your Loudoun garden back to life. Property Service Landscape is more than just lawn mowing and mulching; we are experts in landscape design. Do you have an idea of how you would like your spring garden to bloom? Or would you rather have some planting ideas generated for you? Owner, Brian Wedemeyer, has been planting spring gardens in Northern Virginia all of his life and is just a phone call away from making your garden the center of your landscape design. The red clay soil of Northern Virginia is tough on plants, shrubs, grass and trees. It falls under a class of soil known as ultisols. Ultisol is characteristically acidic in nature and rich in iron oxide, or rust, which gives the soil its red color. Ultisol is highly water insoluble. The soil also lacks key nutrients such as calcium and potassium, which is needed for the healthy growth of flowers, shrubs, grass and trees. The good news is that with the aid of lime and fertilizers, any lawn or garden in Northern Virginia can flourish. This is why Property Services Landscape begins each planting with a nutrient rich layer of topsoil. Without this topsoil plantings simply cannot get enough nutrients from the soil to maintain healthy growth. So let’s talk flowers now. Flowers, or flowering plants, are plants that can produce fruit, seeds and flowers. They are also the largest group of plants known to man. For planting purposes flowers are generally broken down into two categories: annuals and perennials. Annuals compete their entire life cycle in one growing season. Common types of flowering annuals in Northern Virginia gardens are Pansies, Petunias and Begonias. Flowering annuals come in a wide range of colors and grow quickly, which is why they are a go to for many gardeners. They can easily fill up empty space in a garden and are also commonly used in flower pots. Perennials are plants that grow throughout the spring and summer, and die in the fall or winter only to return the following spring. Popular flowering perennials for most Loudoun lawns are Russian Sage, Astilbes, Daffodils and Lilies, to name a few. Perennials, when planted and cared for correctly, come back thicker and lusher every year and can be divided and planted elsewhere in your Loudoun Garden. There are also Biennials, which need two years to complete a full life cycle but for simplicity can fall into the perennial category. And there are some flowering plants that can behave as an annual or a perennial depending on what climate they are grown in. So what flowering plant is right for your Loudoun landscape? Generally speaking a mix of annuals, to fill in bare spots and add immediate color, and hardy, beautiful perennials that will return year after year to your garden. When you are ready to talk about your Northern Virginia garden design give Brian a call at 703-771-8176 and find out what Leesburg’s lawn service specialists can do for your landscape.